Sudan’s military has overthrown the country’s longtime president, Omar al-Bashir. 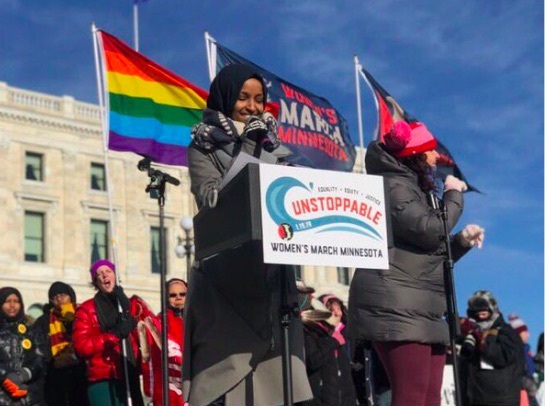 It’s a huge win for the hundreds of thousands of Sudanese protesters who have taken to the streets for months calling for his ouster — and for the brave women who have been a driving force in the protest movement. Sudan’s Defense Minister Awad Mohamed Ahmed Ibn Auf announced Thursday that al-Bashir, who has been indicted by the International Criminal Court (ICC) on charges of committing genocide and crimes against humanity in Sudan’s Darfur region, had been taken into military custody. While it’s unclear if the military plans to turn al-Bashir over to the ICC for prosecution, it’s pretty clear that his brutal 30-year reign has come to a definitive end. Much of the credit for al-Bashir’s removal goes to the women who have played a prominent role in the uprising that has swept the country and who have become the faces of the largely peaceful movement to topple the regime. Earlier this week, an iconic photo of a woman named Alaa Salah, a 22-year-old engineering and architecture student, addressing protesters from atop a car went viral. The image, captured by local photographer Lana Haroun, shows Salah standing on a white car surrounded by a sea of people outside the presidential compound and army headquarters in Khartoum, Sudan’s capital. 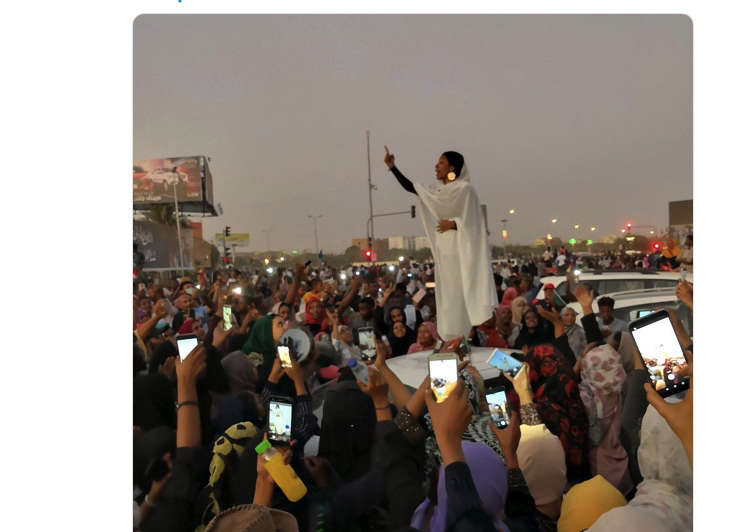 Wrapped in layers of shimmery white fabric styled as a “toub” — a traditional Sudanese style of dress for women — and gold moon earrings, Salah towers over the crowd of protesters, her finger raised defiantly in the air. 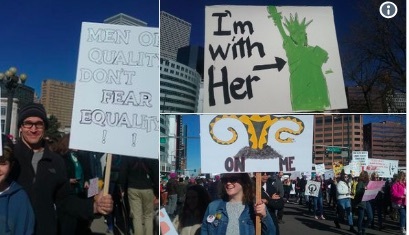 Marches and protests are being held Friday [March 8] across the globe to mark International Women’s Day under the slogan #BalanceforBetter, with calls for a more gender-balanced world. 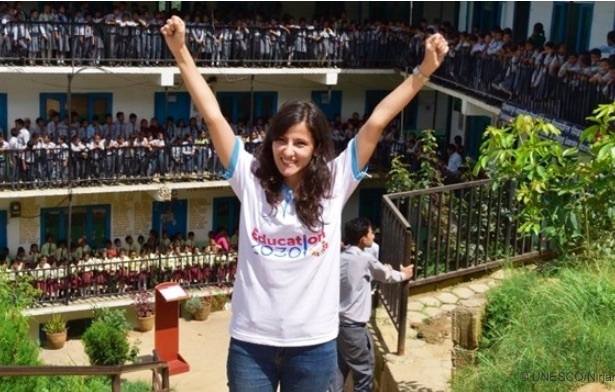 The day, sponsored by the United Nations since 1975, celebrates women’s achievements and aims to further their rights. Political parties in India have for years been promising 33 percent of seats for women in the country’s Parliament, but they have yet to enact legislation to that effect. 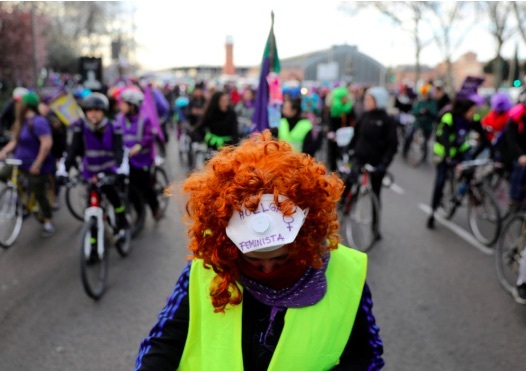 Women’s rights have become one of the hot topics in the run-up to a general election in Spain next month. 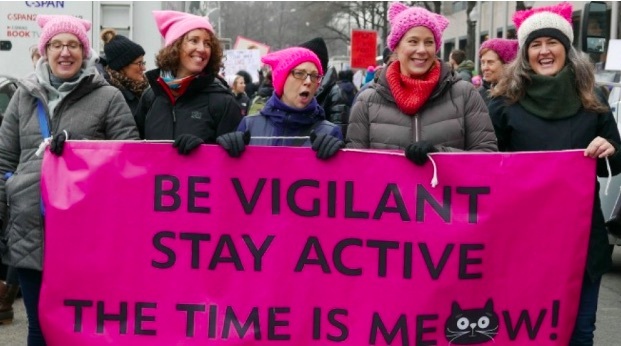 Many female employees didn’t show up to work Friday. Others halted domestic work or left to men the care of children and ill or elderly people. 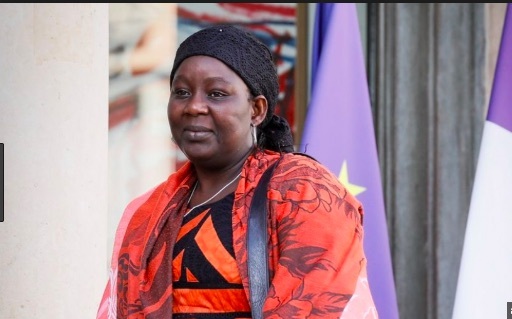 In France, the first Simone Veil prize went Friday to a Cameroonian activist who has worked against forced marriages and other violence against girls and women. Aissa Doumara Ngatansou was married against her will at age 15 but insisted upon continuing her studies as a young wife. She has since turned her attention to victims of Boko Haram extremists. 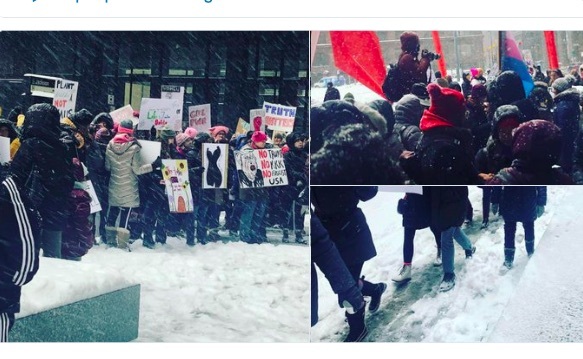 Meanwhile in Russia, International Women’s Day is a public holiday but it mostly lauds gender roles that are now outdated. As is his custom every year, President Vladimir Putin gave a speech thanking women for their patience, good grace and support. 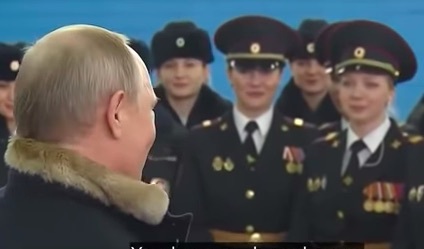 “You manage to do everything: both at work and at home and at the same time you remain beautiful, charismatic, charming, the center of gravity for the whole family, uniting it with your love,” Putin said. 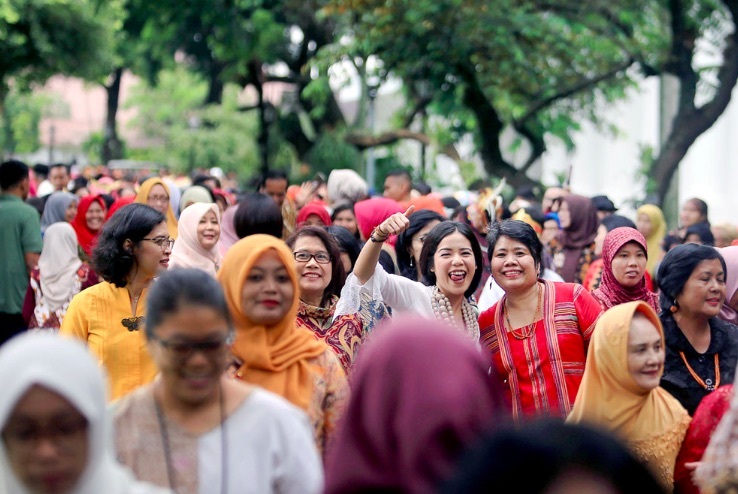 In Indonesia’s capital Jakarta, several hundred men and women carried colorful placards calling for an end to discriminative practices such as the termination of employment for pregnancy and exploitative work contracts. 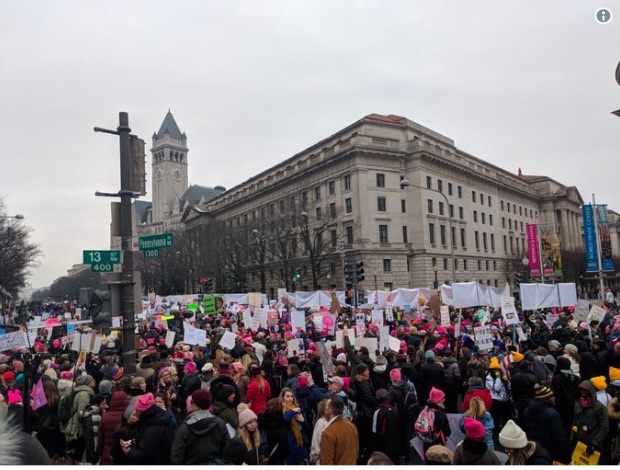 “Our action today is to urge (the government) for our right to a society that’s democratic, prosperous, equal and free from violence,” said Dian Trisnanti, a labor activist. Girls and women in Indonesia, the world’s fourth most populous country, have equal access to education but face higher unemployment, lower wages and poorer working conditions than men. Both Koreas marked the day. 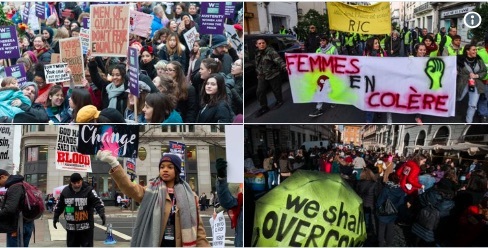 In the South, women wearing black cloaks and pointed hats marched against what they describe as a “witch hunt” of feminists in a deeply conservative society. In the North, where Women’s Day is one of the few national holidays that is not explicitly political in nature, people dressed up for family photo shoots or bought roses for their mothers or wives at the many small, bright orange street stalls in central Pyongyang that sell flowers. The stalls normally do most of their business selling flowers to be placed at the feet of statues to the country’s leaders. In the Philippines, hundreds of women in purple shirts used a noisy march and protest in Manila to call for the ouster of President Rodrigo Duterte, whom they rebuked for the often sexist jokes he cracks and authoritarian moves they say are threatening one of Asia’s liveliest democracies. On the eve of International Women’s Day, U.S. first lady Melania Trump saluted women from 10 countries for their courage. “Courage is what divides those who only talk about change from those who actually act to change,” Mrs. Trump said at a ceremony Thursday that was also attended by Secretary of State Mike Pompeo. In Nigeria, the U.S. Embassy hosted talks on sexual harassment that included a founder of the recent #ArewaMeToo campaign among women in the country’s conservative, largely Muslim north. And in Niger, first lady Aissata Issoufou Mahamadou oversaw the awards in the Miss Intellect Niger contest. Women protested against gender-based violence in Kenya’s capital. AP reporters across the globe contributed to this report. Hatton reported from Lisbon, Portugal. 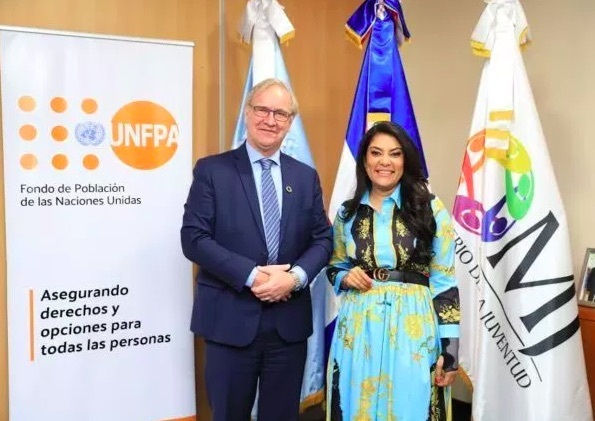 The Ministry of Youth and the United Nations Population Fund (UNFPA) held today [6 March] the conversation “Let’s talk about everything”, in commemoration of International Women’s Day, with the theme “Promoting a culture of adolescents and young women without violence “. The activity, held in the Hall of Fame of the Juan Pablo Duarte Olympic Center, was attended by about 800 young people and teenagers from public and private schools, as well as young people from civil society who spoke of the campaigns “Noviazgo Sano” and “Reset”. The discussion is based on the results of the “Amore ‘Without Violence” online test, according to which 52% of young men and 35% of young women frequently consider that “Women should behave and give up some things so as not to provoke the jealousy of their partner”, which highlights the gender inequality that occurs in the relationships of adolescents and young people. In addition, 53% of men and 40% of women think that “love is an unconditional feeling that forgives everything”, this being one of the main reasons why the manifestations of violence are normalized and justified. 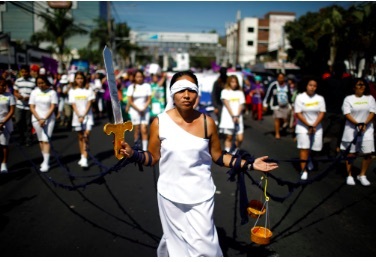 Through the page amoresinviolencia.org, more than 2,500 people were able to evaluate their courtships, showing that 51% are in a relationship with mild or severe practices and attitudes of violence, either their own or their partners. The test has two modalities, one to diagnose if violence is exercised and another if it is received. The self-assessment showed that out of every 100 men who completed the test, five are reproducers of the highest level of violence, characterized by high levels of control over the couple, as well as serious manifestations such as breaking objects, shouting, insulting, physically attacking or forcing sexual relations In the case of women, only one in 100 presents these manifestations. The “Amore ‘Without Violence” campaign will continue to offer tools to help eradicate gender-based violence in dating relationships in the Dominican Republic, promoting respectful cultural guidelines and gender equality, through face-to-face and digital interventions in @tunotapaeso and amoresinviolencia.org, where the test is still available to detect signs of violence. The initiative also disseminates two instruments: a “violentometer”, where people can identify if they are in one of the degrees of violence, and an “amorómetro”, where levels of a healthy relationship are presented. The first is a rule that measures the degrees of aggressiveness and its manifestations in three levels, assigning shades of yellow to red, according to the danger to the victims. While the second identifies good practices on a scale that goes from blue to green. We are women leaders representing a range of fields from 43 countries. We welcome the imminent occasion of the 2019 DPRK-USA Vietnam Summit held in Hanoi from February 27-28. We are hopeful about its potential to achieve a major breakthrough toward ending 70 years of hostile relations between the United States and the Democratic People’s Republic of Korea (DPRK/North Korea). Your mutual commitment to ushering in a new era of peace in Korea will not only benefit 80 million people living on the Peninsula but will also help transform unresolved historical tensions throughout the region. 1) Declare an end to the Korean War and a new era of peace. 3) Normalize relations by a) establishing reciprocal liaison offices; b) lifting sanctions that harm vulnerable individuals; and c) facilitating people-to-people engagement, including reunions between Korean-Americans with their families in North Korea. 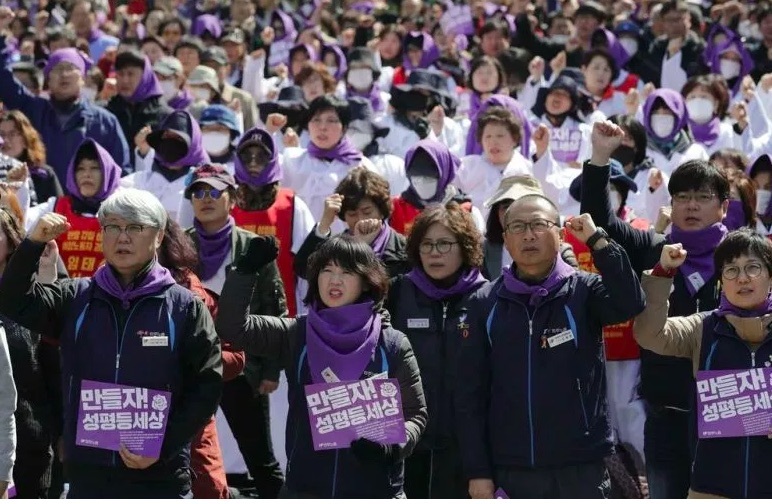 We are writing now to stress that, in order to truly achieve a lasting peace that would endure as a legacy for Korea and the world, an inclusive peace process with women at the table is essential. 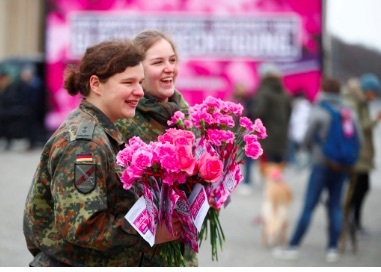 As decades of studies have shown, women’s participation significantly increases the probability that a peace agreement will be signed and will last far longer than otherwise. Indeed, peace agreements are 36 percent more likely to succeed when civil society representatives, including women’s groups, meaningfully participate. Recognizing this, President Trump signed into law the Women, Peace, and Security Act of 2017, signaling U.S. commitment to increase women’s participation in peace processes to prevent, end and rebuild after conflict, which passed with bi-partisan Congressional support. Now is the time to implement it. Our representatives from the global campaign Korea Peace Now! 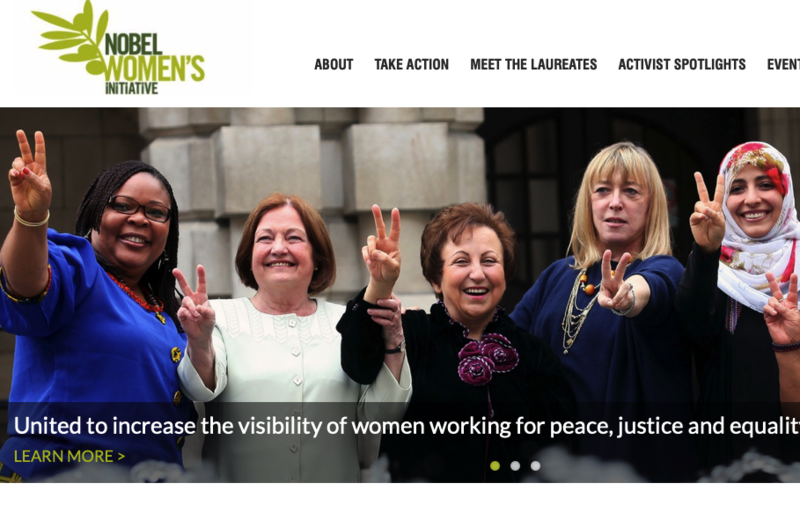 Women Mobilizing to End the War will travel to Hanoi, Vietnam, to be present during the summit. Drawing upon their extensive experience in international peace-building, we respectfully request your assistance in securing a meeting for them with US-DPRK negotiators to discuss an inclusive peace process that includes women at all levels. Their insight and expertise will prove to be invaluable to this delicate and challenging peace process. Thank you for your consideration. We look forward to your timely response. 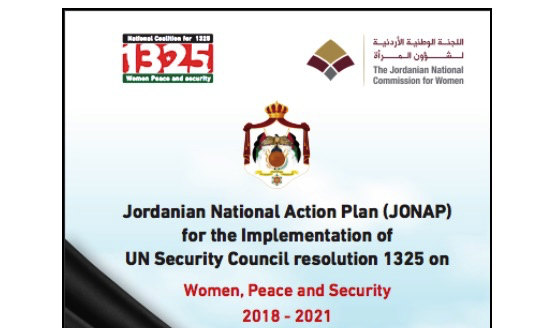 The (2018-2021) Jordanian National Action Plan (JONAP) for advancing the implementation of UN Security Council resolution 1325 on Women, Peace and Security (UNSCR 1325), and its subsequent resolutions, was developed to respond to the country’s latest security and military challenges. It is in line with Jordan’s commitments to promote and respect human rights, justice, equality and participation—all of which are embodied in various national frameworks, such as The National Strategy for Jordanian Women (2013-2017) and The Comprehensive National Plan for Human Rights (2016-2025). 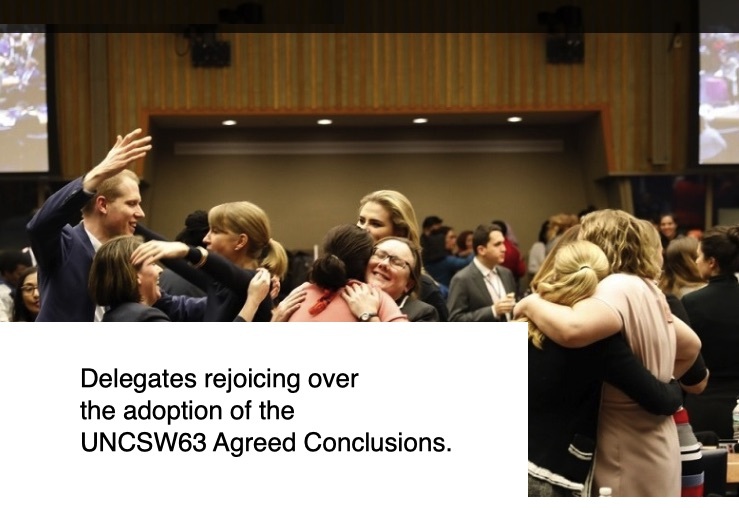 The JONAP for advancing the implementation of UNSCR 1325 aims to integrate a gender-based approach towards women’s participation in prevention and protection processes during conflicts, as well as in peace building, and maintaining stability and sustainable security. 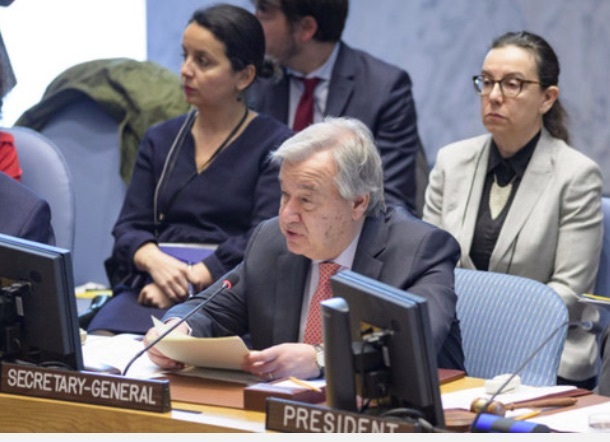 Parallel to these efforts, the JONAP specifically responded to the 2015 UN Security Council resolution 2242, which highlights the importance of cooperation with civil society and the role of women as key partners in preventing and combating violent extremism. It also reiterates the importance of engaging men and boys as partners in promoting women’s participation in the prevention and resolution of armed conflicts. The process of drafting the JONAP on resolution 1325 began as Jordan and other countries were endorsing the 2030 Agenda and the Sustainable Development Goals (SDGs). 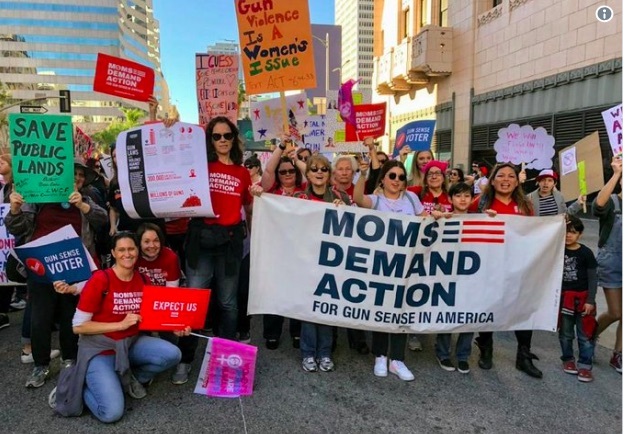 The Agenda’s overall objectives—and Goal 5 and its targets in particular—represent an opportunity to transform development and planning approaches and mechanisms for implementation, to ensure equality of opportunity and the empowerment of women. Furthermore, they provide a means to ensure the inclusion and participation of all segments of society, for the fair and efficient implementation of comprehensive and sustainable development. Thousands of women in India’s coastal state of Kerala joined together, forming a 386-mile wall, to send a message in support of gender equality. 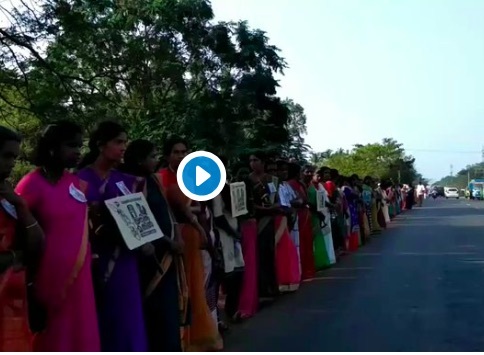 Official sources told the BBC that approximately five million women from different parts of Kerala took to highways to form a human chain in protest of gender disparity. The “women’s wall” stretched from the capital city of Thiruvananthapuram to the northern district of Kasaragod. The demonstration is part of a series of protests against a ban which prevents women of “menstruating age” (ages 10 to 50) to enter the temple. India’s Supreme Court had overturned the ban back in September, however, attacks on female visitors by conservative groups persist, citing a violation of the holy site. The “women’s wall” was initially proposed by Kerala’s Left Front Government and was originally scheduled to take place in December 2018. 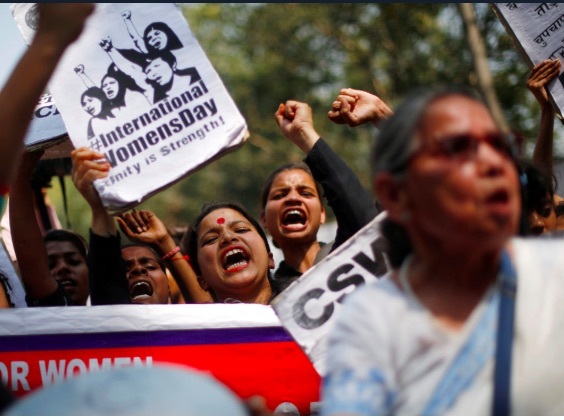 In November 2018, dozens of protesters at the Sabarimala Temple were arrested for demanding the removal of a ban on overnight stays, which was implemented by the government as a response to right-wing demonstrations against women devotees. 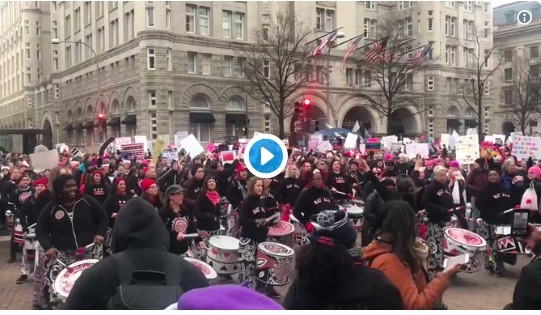 However, since the court order gained prominence, a major battleground has manifested between devotees and gender activists, sparking protests across the southern state. 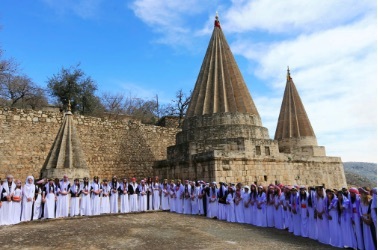 More than 2,000 people were arrested following clashes near the temple in October. 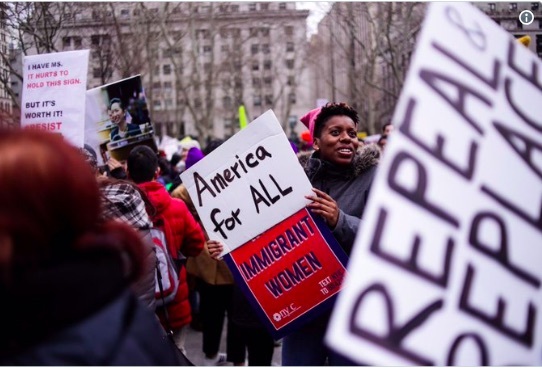 The Supreme Court will hear challenges to the decision to overturn the ban, starting January 22.